Subscriber opt-in rate percentages are a representation of the number of visitors that interacted with your opt-in prompt and either accepted or denied notifications. Subscriber opt-in rate percentages are a representation of the number of visitors that interacted with your opt-in prompt and either accepted or denied notifications. Since some website visitors may not be eligible to subscribe to notifications, this is often not a representation/percentage of all website visitors. Approved Notifications/(Approved Notifications + Denied Notifications) = Opt-in Rate Percentage. While this is fairly straight forward when dealing with only the native/browser prompt, it can get a bit more complex when dealing with Custom Opt-in Prompts. This stems from the fact that custom opt-in prompts are 2-click instead of 1-click and someone can approve the custom opt-in prompt and then accept/deny/ignore the native/browser prompt. Below is a table that breaks down the logic as to when someone is marked as "Approved" or "Denied" when dealing with custom opt-in prompts. 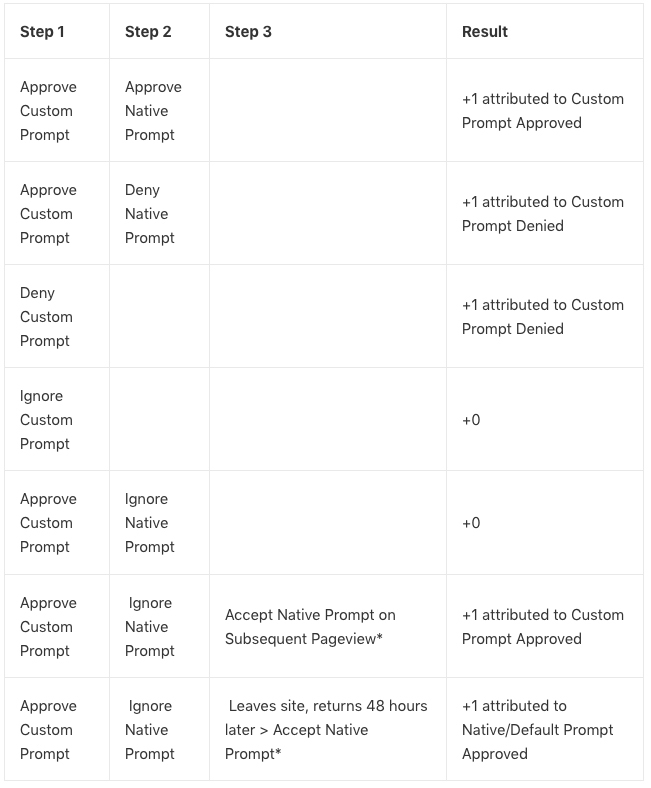 * If the visitor views another page within the next 7 days that requests push permissions and previously accepted the custom prompt, it will only show the native/browser prompt.